The 'Selfie Pod" is about to become a red hot holiday gift in the U.K.
From the "wish we had thought of that" department comes the Selfie Stick. We first told you about this nifty smartphone accessory last Summer. Essentially a long pole that secures your smartphone on one end and has a grip on the other, the Selfie Stick allows you to hold back your front-facing camera so that the field of view is wider. It is perfect for snapping group selfies, even though some flagship handsets come with a wide angle front-facing camera for that purpose. Now, a couple of businessmen named Neil Harvey and Steve Pengelly have produced their own version of the stick in the U.K. 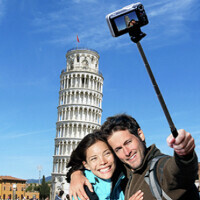 The pair call their product the Selfie Pod, which is also the name of their company. The most basic model comes with an extendable pole and relies on the self-timer on your phone to snap the picture. This basic Selfie Pod will cost you the dollar equivalent of $12.56 USD. Other versions of the stick come with a Bluetooth shutter release on the handle, and are priced starting at $23.56 USD. Overall, there are five different variants of the stick offered by the company. The origin of the Selfie Pod comes from snowboarders and other extreme sports athletes, who fastened a smartphone to a pole in order to capture themselves in action. The fad caught on in Asia and was seen as a way to capture video of a band at a concert, unobstructed by the crowd. 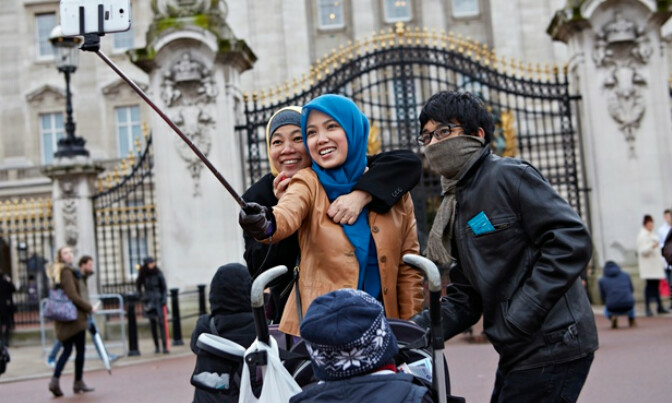 At famous tourist spots, more of the attraction could be included in a selfie, by using the stick. Harvey and Pengelly started their company after attending the wedding of a friend in Asia. The pair was stunned to see hundreds of guests attach their phone to a pole in order to take selfies. That was the "Aha!" moment when the pair realized that there was money to be made from such a product. Harvey and Pengelly have sold 6000 Selfie Pods in the U.K. from August through November. The pair has ordered another 5000 units to sell during the holiday shopping season. But why not make this a world-wide phenomenon? The Selfie Pod sounds like the perfect product to pitch on QVC or HSN. Perhaps the co-founders of Selfie Pod should try to get on ABC's Shark Tank so that they can wag their stick at QVC Queen Lori Greiner. Better have some patents though, because the Selfie Pod seems like an easy product to knock off. Why? It is a product that fills a need. I wish I had patented something like that. It's been around for a year in our country so somebody must already made patent with it. Actually, its first commercial name was "quik pod", and it was invented by Wayne Fromm in 2004. Google it out. Yeah, just like a blow-up sheep for you-know-what... The fact that it fills a need doesn't make it any less of a facepalm subject. Selfies in and of themselves are pretty lame, but with the addition of a stick in the lower corner?!? Yep because asking someone to hold your 800$ flagship and they running away after is way better right? Lol, I was just going to say that. That shutterstock girl again! Those are called monopod in our country, costs $4 if you go for substandard quality. This actually doesn't seem as stupid as it looks. "a couple of businessmen named Neil Harvey and Steve Pengelly have produced their own version of the stick in the U.K." So like how does this 'stick' defer to other sticks? This is a great little tool if you want to take a selfie. When I visited a year ago, I think everyone in korea had one rofl. What would be a little bit better would be a rugged 2-3 inch screen on the stick(in the middle or close to your hand) to show you what you are looking at if you are using the Bluetooth shutter release and obviously using the rear (usually better quality) camera. That way you don't have to keep trying to guesstimate height and position of your stick every time to get that "perfect" picture. My family and I have been on vacation to Thailand and we asked someone to take a picture with my wife's, at that time, brand new Sony Hx-300 camera and as we started backing up and to get ready for the picture, the dude ran off with it. I would love to have one of these for Vacation purposes ONLY if a smartphone was my primary source of pictures. The inspiration for this I guess came from tiny tripods you get for digital cameras that you can connect a Bluetooth shutter control switch to, to take your pics. These Selfie-sticks/pods are just another iteration of those pretty much. Instead of placing your phone down in a fixed spot (like the tiny tripod), these allow you to have an infinite angle option available. I get the concept behind the stick, wider shot and whatnot, but why on earth would they not make it a simple to set easy stand/fold tripod with a button for trigger instead? I do not, get the stick thing it looks horrible in the pictures. Or you know, allow you to bend it at certain angles or such, to at the very least hide the stick a little in the shot?